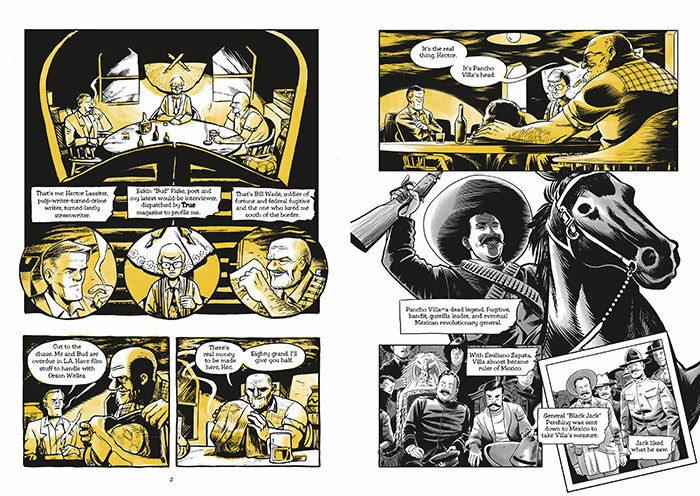 In this graphic novel adaptation of the Edgar®-nominated novel Head Games, Craig McDonald blends history and legend to tell the tale of the classic hard-drinking, hard-living, and hard-boiled protagonist. Artist Kevin Singles brings this noir thriller to life with a style reminiscent of the golden age of dime-store paperbacks. It's 1957, and aging novelist Hector Lassiter thought that his adventures were long behind him. 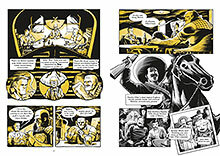 But then he receives a treasure worth killing for: the skull of Mexican revolutionary Pancho Villa. "Featuring more than enough action (both pulse-pounding and sultry) to please pulp purists, as well as cameos by Orson Welles, Marlene Dietrich, Ernest Hemingway, and a young George W. Bush, author McDonald ably adapts his own novel, while illustrator Singles' artwork brings a gritty edge to every page. VERDICT: Good fun for fans of pulp, crime, or historical fiction." "The mix of twentieth-century fact and fantasy is a fun touch. If you enjoy watching an author play connect-the-dots with bullet holes and blood, this Head's for you." "This pulpy alternate history adds color to what is otherwise familiar noir territory, complete with seedy schemes, gunfights, and a narrow-eyed woman in trouble. It's a breezy thriller designed to hit the sweet spot for crime fans and history buffs alike." "Faithful to the original novel; captures the vibe of 1950s noir... If noir fiction is a genre from a bygone era, then Head Games takes readers on a trip through time minus the DeLorean and the Tardis." "Not since reading EC Comics and Road to Perdition have I come across such an interesting combination of comic book and hardboiled fiction. This a more mature read, but definitely worth it. Recommended for the adult comic book lovers I know. This graphic novel works as well as any suspense story or western I have read, and there are many elements of those genres mixed in. The images and story punch the reader in the face (in a good way). This one will keep you hooked." 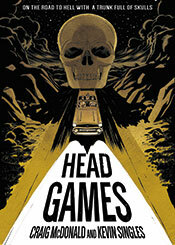 "The graphic novel adaptation of HEAD GAMES certainly has...plenty of action and humor to keep you engaged from start to finish." "I could really see the story in my head. I had the voices and all the mannerisms playing in my head for each character. That was almost entirely due to the short snappy text... Honestly this was an enjoyable read. It was something completely different to anything I'd read before, and after finishing it I'm intrigued to see what the unabridged novel holds." "Both the novel and its new rendition recount a classic tale of a hard-boiled writer embroiled in a scheme to sell the skull of Mexican revolutionary Pancho Villa." "The story by McDonald is engaging, romantic and fearless. 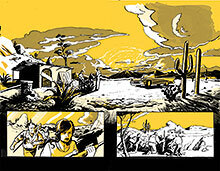 The art by Kevin Singles and Les McClaine is stunning. Altogether, a fun pulp graphic novel that romanticizes the characters and the time."